Church building Fulfilled 2500 year old Prophecy. "And I also cast my eyes round about, and beheld...a great and spacious building; and IT STOOD as it were IN THE AIR, HIGH ABOVE THE EARTH. And it was filled with people, both old and young, both male and female; and their manner of dress was exceeding fine; and they were In the attitude of mocking and pointing their fingers towards those who had come at and were partaking of the fruit. 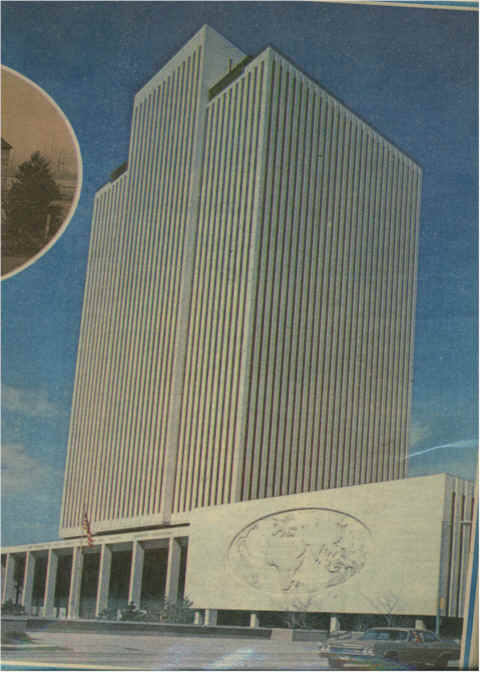 This picture is a picture of the Church office building located in Salt Lake City, Utah as it appeared in 1980. CLICK HERE to learn more about that building. And the people in it. And now I, Nephi, do not speak all the words of my father. But, to be short In writing, behold, he saw OTHER MULTITUDES pressing forward; and they came and caught hold of the end of the ROD OF IRON; and they did press their way forward, continually holding fast to the ROD OF IRON, until they came forth and fell down and partook of the fruit of the tree. And he also saw OTHER MULTITUDES FEELING their ways TOWARDS THAT GREAT AND SPACIOUS BUILDING. And GREAT WAS THE MULTITUDE THAT DID ENTER into THAT STRANGE BUILDING. And AFTER THEY DID ENTER INTO THAT BUILDING they did point the finger of scorn at me and those that were partaking of the fruit also; but we heeded them not. And all these things, of which I have spoken, were done as my father dwelt in a tent...I Nephi, was desirous also that I might see, and hear, and know of these things, by the power of the Holy Ghost, which is the gift of God unto all THOSE WHO DILIGENTLY SEEK HIM...For he (God) Is the same yesterday, today, and forever; and the way is prepared for all men...lf It so be that they repent and come unto him. For he that diligently (with much effort) seeketh shall find; and the mysteries of God shall be unfolded unto them...And it came to pass that I beheld that THE ROD OF IRON, which my father had seen, WAS THE WORD OF GOD...and WHOSO WOULD HEARKEN UNTO THE WORD OF GOD, and would hold fast unto it, they WOULD NEVER PERISH..."
(1 Nephi 8:26, 27, 29, 30, 31, 33; 10:16~19; 11:25; 15:24; From the Book of Mormon) About 600 B.C. Now see: ( 2 Nephi 3: fruit, fruit, fruit. AND WHAT THE FRUIT REALLY IS. In that one (1) Chapter it tells 19 yes, (19) times what fruit really is. See for yourself. Say reader, did you notice that "World Map" on the North and South sides of that Church Office building photo above? So let's see what 1 Nephi Chapter 11 tells us about it. "11: 35 And the multitude of the earth was gathered together; and I beheld that they were in a large and spacious building, like unto the building which my father saw. And the angel of the Lord spake unto me again, saying: Behold the world and the wisdom thereof; yea, behold the house of Israel hath gathered together to fight against the twelve apostles of the Lamb. "38 For it shall come to pass that the inhabitants of Zion shall judge all things pertaining to Zion. and prophets shall be known. 40 And even the bishop, who is a judge, and his counselors, if they are not faithful in their stewardships shall be condemned, and others shall be planted in their stead." CLICK HERE to see what causes that building to fall.